This statue represents the Genius, or soul of a young male figure. In his left hand he holds a cornucopia and from his left shoulder falls an aegis (sign of divine protection) or cape decorated with serpents. The surviving decorations are marble reliefs; however, traces remain that tell us the aegis was was decorated with bronze serpents as well. The spirit’s thin body is in part the product of restoration – the legs are not original to the statue. Three different hypothesis exist on the exact nature of the statue: the cornucopia and aegis are sometimes connected with the deity Jupiter, thus causing some to believe that the statue represents the Genius of Jupiter himself. Unfortunately, there are few examples in art of the god with these specific items, which makes this theory impossible to prove. The second theory proposes that the figure is a military Genius: such figures can be found on coins, particularly those dating to the time of Trajan Decius. According to other scholars, the figure could be the Genius of an emperor as the aegis is a common piece of iconography in imperial portraits. This theory is perhaps the most criticized of the three, as emperor’s were rarely depicted in a wholly idealized manner. As revered and powerful as an emperor might be, they were generally depicted in a realistic way so the people would recognize their ruler. This Genius, with its bland and perfect features could be a hundred different men. The statue is done in the Apollonian style of the fourth century B.C. The expression of the Genius is lively and his hair is held back partially by a band, while the rest in gathered in a corymbos on top of his head. The work cannot be said to be a piece of high artistic merit, but it’s subject matter has allowed it to be an object of much study and interest. The cornucopia, ideal rendering of the body, and divine facial features are all undisputed attributes of a Genius, but the presence of the aegis is an oddity that confuses the process of identifying the figure. 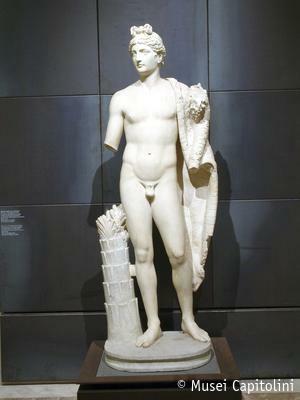 The statue, dated to Domitian age, was found near Via Labicana.